The name Strawberry Matches brings to mind flaky pastry, strawberry jam, cream and pink icing to me. Mum used to make the pastry herself, put the jam inside with the cream and topped the whole lot with pink icing – they were Yummy. Sadly this isn’t Mum’s original recipe, but they are much quicker to make and probably taste almost as good. 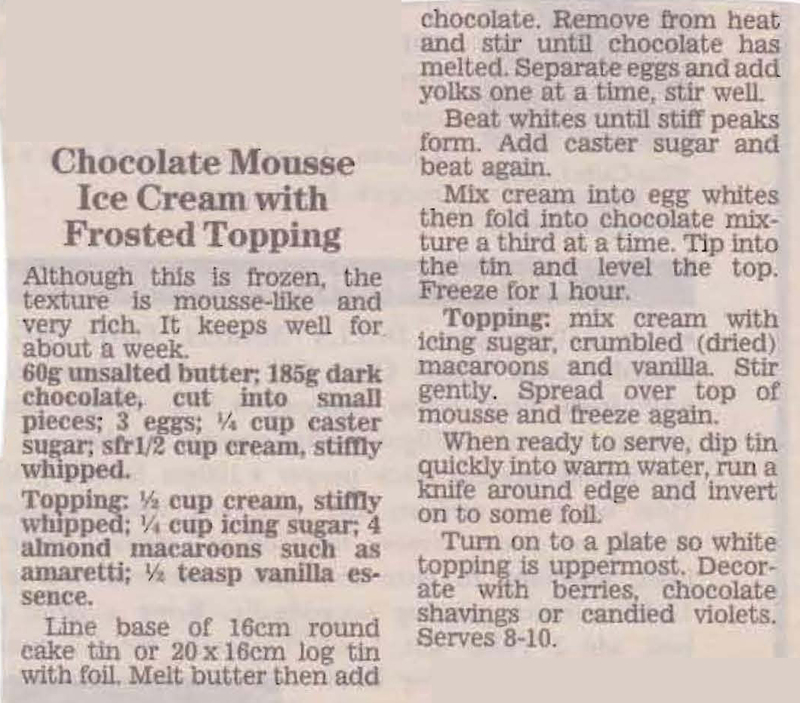 To me there’s a couple of advantages with this recipe, a. it contains chocolate mousse and b. you can make it a week in advance. When you’re catering for a crowd the trick is to do as much pre-preparation as you can so that on the day/night of the party you aren’t stuck in the kitchen all the time. 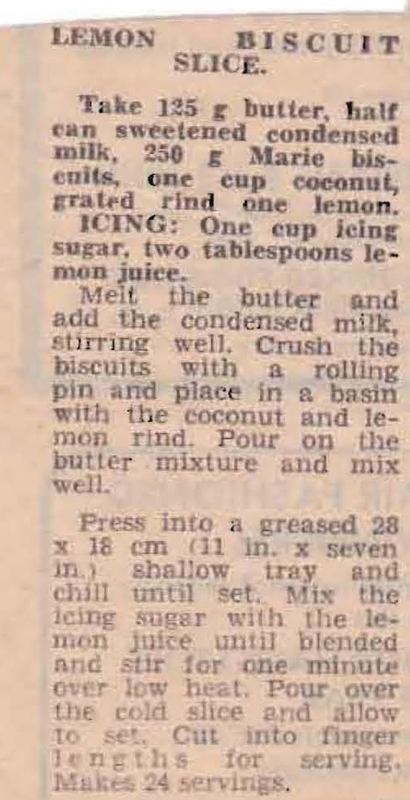 For that reason alone this recipe could be well worth trying out. 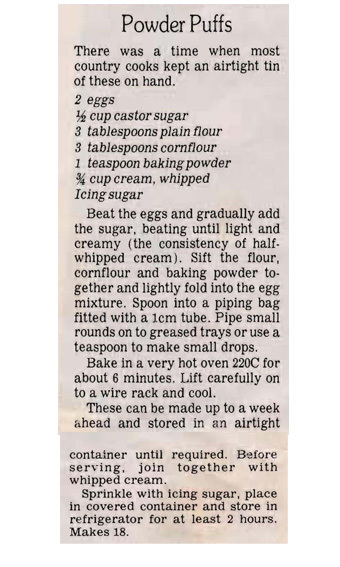 This recipe pops up a couple of times in Mum’s collection. The first one is pre-metrics so it dates from at least the 1970s. This version has been converted which makes it a bit easier for us now. It’s a pretty simple no bake slice, but it does taste lovely and lemony. 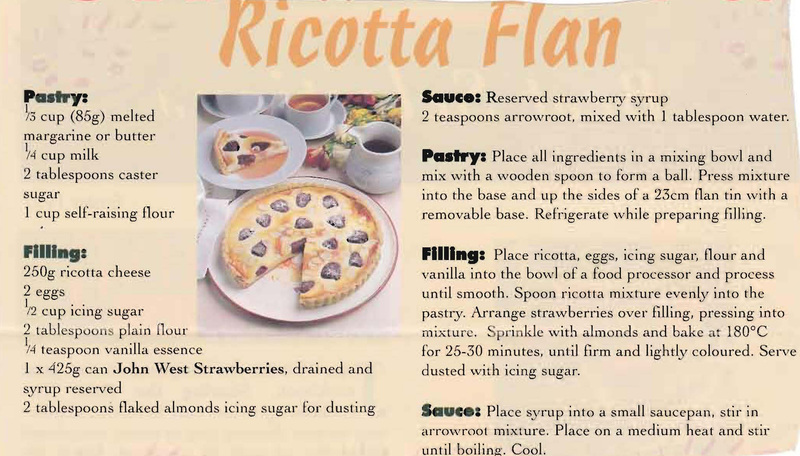 This little recipe book compiled by the Keysborough Bowls Social Club is overflowing with great slice ideas so I’ve decided to try to post a recipe each week. 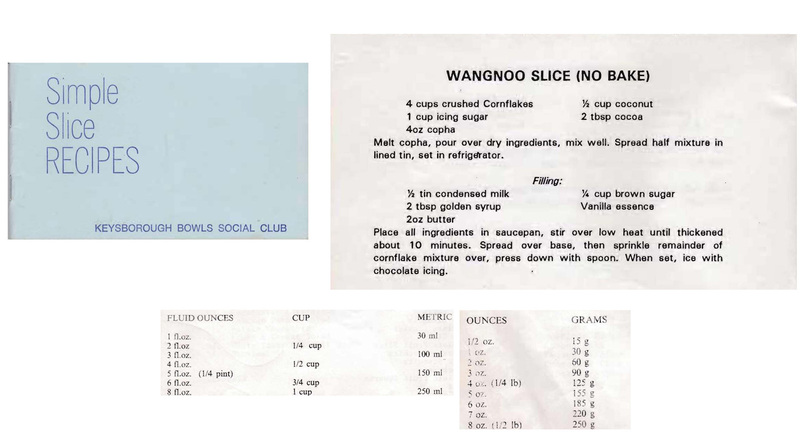 I’ve made this slice many times myself, but I have it in my collection as Wanganui Slice. I’ve always thought that it was named after the New Zealand town of Whanganui. Whatever the name, it tastes good, although it is rather on the sweet side. 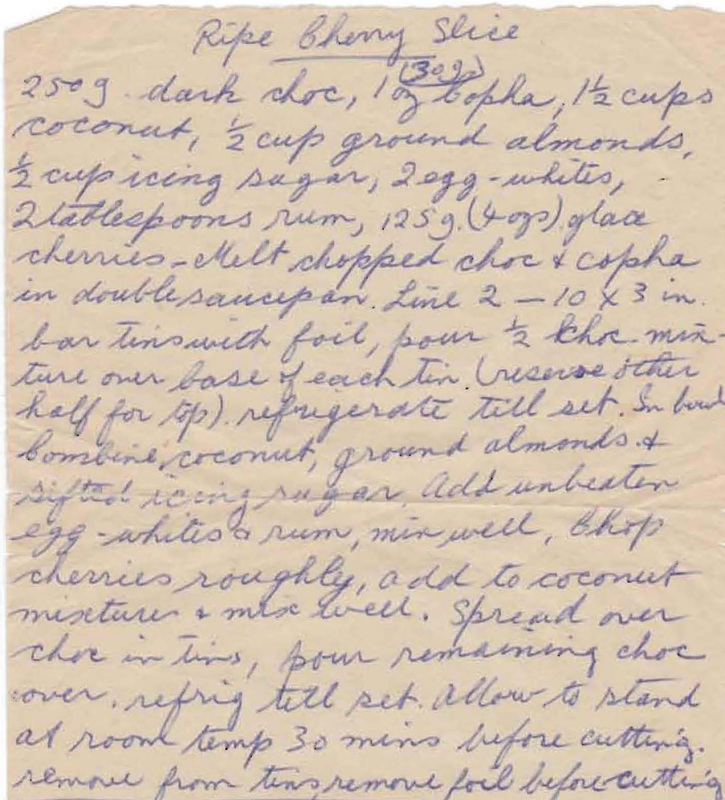 This homemade take on a Cherry Ripe comes from Mum’s friend Thel, who was a great cook and gave Mum some terrific recipes. Melt chopped chocolate and copha in double saucepan. Line 2 – 25x8cm bar tins with foil, pour half chocolate mixture over base of each tin (reserve the other half for top). Refrigerate until set. In bowl combine coconut, ground almonds and sifted icing sugar. Add unbeaten egg whites and rum, mix well. Chop cherries roughly, add to coconut mixture and mix well. Spread over chocolate in tins, pour remaining chocolate over. Refrigerate until set. Allow to stand at room temperature 30 minutes before cutting. Remove from tins, remove foil before cutting. These were one of Mum’s treats that I can remember coming home to after school and finding leftover from an afternoon tea Mum had had for her friends. They were light and filled with fresh cream with a light dusting of icing sugar, my mouth waters just remembering them.